How to Proceed with Online Voter Card Registration? Online voter card registration means that you can fill the voter card registration form no. 6 on your computer screen itself and not require to visit the ERO office personally. To apply for voter card online, it is not mandatory to upload the required documents. This is because, even if you do not upload the documents, the BLO would collect and verify them when he/she visits your visits your residence for verification post the successful acceptance of your application. Moreover you can still upload these documents in .PDF format while filling the form no. 6 online. Select your state of residence. On the next page, enter the confirmation code that you you receive on your mobile number. Fill in all the details on the presented online form no. 6. Upload photograph in .JPEG format(this picture would be levied on your voter card) and documents in .PDF Format. Keep a record of your unique voter card application id(this would help you check your voter id application status). After your application for voter card is successful, you can expect a visit from the BLO of your area, he would verify your identity and documents. Post successful verification, your name would be included in the voters’ list of your constituency and you would receive your voter card. The time taken to issue voter cards varies depending on the mode of application you choose. For example online voter card registration takes around 30-45 days whereas the number of days increase many fold if you choose the offline application method for the voter card. 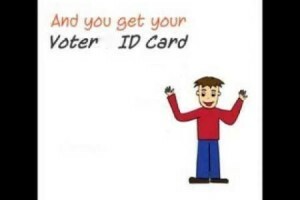 Can I Vote Without my Voter Card? It is a pure myth that you can not cast your vote without your voter. It is not true, you can still vote if you lost or misplaced your election card. The only thing mandatory for you to be allowed entry into the polling station is that you must have your name and correct details in the voter list of constituency. There are a few other identity documents that could perform the function that a voter card performs. Your voter id card is an identity card that takes the polling officer into your confidence and ensure him that you are the same person whose name is enlisted in the electoral roll. But you can also prove your identity other identity cards such as driving license, ration card etc. These identity cards must be issued from trusted sources i.e by govt. agencies or departments only. Another important alternative to a voter card is the voter slip. The election officials(mostly BLOs) are charged with the duty of distributing photo voter slips to all the voters in constituency. These voter slips have the voter’s photo and also important details that would help the polling officer verify the voter’s identity. Therefore you can very well vote without a voter card if you have received one of these voter slips. Keeping in mind the alternatives to the voter card, you must also make it a habit to follow latest updates and notification from your states’ CEO and the Election Commission of India. For example, in the Assembly Elections of 2013 in Delhi, it was mandatory for voters to carry their voter slips. So was the case in the Lok Sabha Elections 2014. How to Check Name in the Voter Card List? Once you have successfully filled the voter card application form and your identity is verified by the BLO, then you can expect to see your name in the voters list of your constituency. To check the same, you can either visit the ERO office or just visit the Election Commission of India website/CEO website of your state and access the online PDF electoral rolls and find your names in them. On the ECI website you can click on the icon on the left hand side of the homepage, that says: – ‘Search Your Name in the Voters List‘. On the landing page, select your residing state. You would then be re-directed to the electoral search page of your state’s CEO website, where you would have to provide relevant details like address, application id, etc. to perform your name search in the voters list. If your state’s name is not in the list then you would have to directly visit the CEO website for your state. Also Read: How to Check VoterID Status or Modify the Identity Card from Mobile Phone? What is the Web Address for my State’s CEO website? Although we have included all the State CEO websites in the above list, you can still comment below in case you find anything missing. All in all we have provided you with a fair idea about the voter card registration process and how it works online and offline. We have also tried to bust the myth that a voter card is mandatory for the voters to be allowed their right to vote. But still the importance of a voter id must not be undermined. It is still an essential election commission of India identity document. Therefore, all the voters must ensure that they have an EPIC issued for themselves. This not only help in the longer run(to apply for other documents like driving license, for opening a bank account, etc.) but also helps in keeping the spirit of democracy alive. How Does Election Commission Of India Help to Get a Voter ID Card?